Connect AirPods (or other Bluetooth headphones) to your Mac with a single click or keypress. Requires: macOS 10.11 through 10.14 and a Bluetooth device. See what’s new in version 2.5 (released April 17). AirPods are great, but they don’t work quite as smoothly with Macs as they do iPhones. You can’t tell at a glance whether audio will play from the AirPods or your Mac’s built-in speaker, you have to dig into a Bluetooth submenu to connect, and then you have to go back to the menu to see when the AirPods are ready for use. ToothFairy streamlines this: just click an icon in the menu bar (or press a hotkey) to switch to the AirPods, and the icon always shows whether they’re connected. Click the hollow AirPods icon in the menu bar to switch to AirPods. It fills in to show they are connected and can also display a battery indicator . Now you know that it’s safe to start playing music; it won’t blast from your Mac’s internal speaker. Supports multiple Bluetooth devices ; you can choose a different icon and hotkey for each. Get the best audio quality. 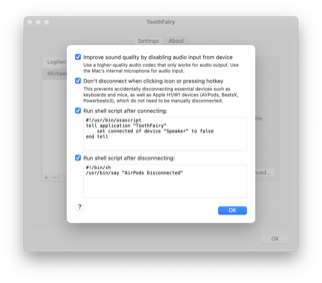 macOS will normally use the SCO codec if it thinks you’re going to use the microphone. ToothFairy can ensure that it uses the higher quality AAC codec when you only care about audio output: listening to music or video or playing a game. Disconnect a Bluetooth device by clicking the icon (or pressing the hotkey) again, so that you can switch back to your phone. AirPods and Beats devices with an Apple H1 or W1 chip do not need to be manually disconnected, and you can set them to avoid accidental disconnections when pressing the hotkey multiple times. 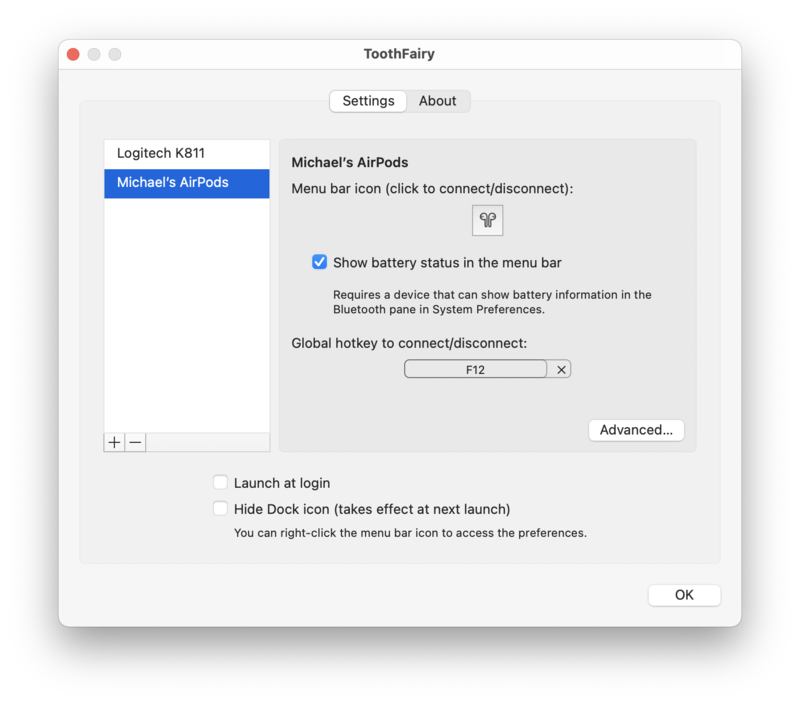 ToothFairy automatically launches at login, so it’s always there when you need it. Optionally hide the Dock icon so it only appears in the menu bar. With the Dock icon hidden, you can right-click (or Control-click) the menu bar icon to access the settings. Run a shell script when the AirPods are connected or disconnected, for example to notify you or to launch or quit another app. Use with your Magic Mouse or Magic Keyboard to make sure the battery level doesn’t get too low, or to quickly reconnect them after charging or if they get disconnected. 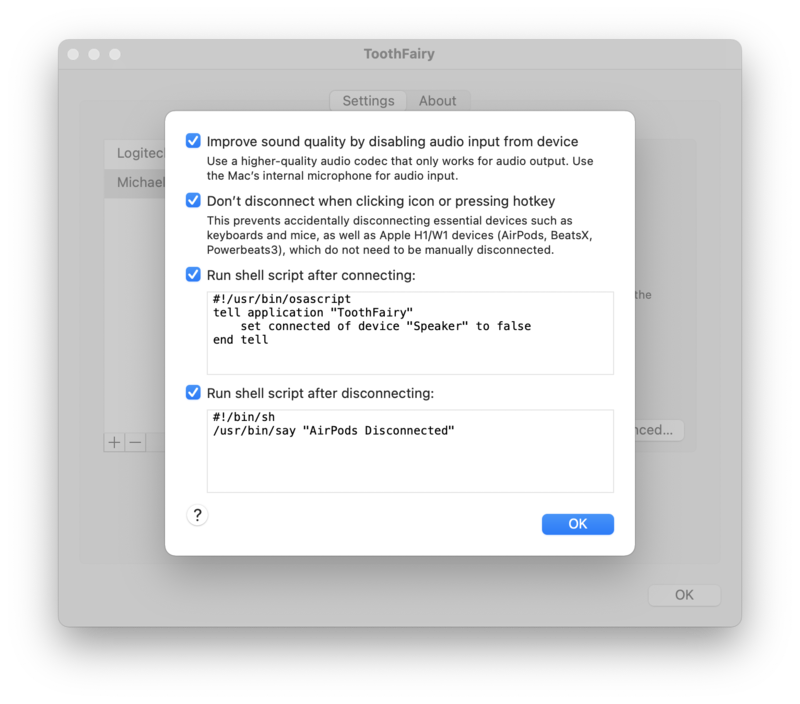 ToothFairy works with devices that can be connected via the macOS Bluetooth menu. Please make sure the devices you want to connect have been paired to the system correctly before using them with ToothFairy. Copyright © 2002–2019 C-Command Software, LLC. All rights reserved. Mac and the Mac logo are trademarks of Apple Computer, Inc., registered in the U.S. and other countries.